A pamphlet by Matthew Leonard. We may separate organic compounds on an analytical scale to quantify and identify (GC-MS, LC-MS). maybe DCVC, an underutilized method which can separate 10-100 g at a time. 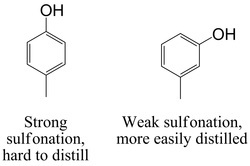 Separating very similar compounds on a preparative scale sometimes isn't possible with the above methods. There are clever techniques to get around this which I collectively call Advanced Preparative Separation. Eucalyptol (cineole) is known to form crystalline adducts with halo acids, o-cresol, resorcinol and phosphoric acid. All of these may be exploited to separate out the eucalyptol from the rest of an essential oil. It is self evident that the sterically unhindered oxygen hetero-atom is responsible for the formation of these adducts. "One of the earliest American patents on coumarin (1922) described a process in which the crude coumarin is treated with a solution of calcium oxide. On stirring and heating, the coumarin is gradually converted to the water-soluble calcium salt. The impurities, mainly salicylic aldehyde and its acetate, can be separated by filtration. 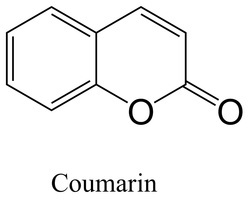 The filtered coumarin salt is then acidified and the liberated coumarin further purified by fractional distillation. A later patent takes advantage of the ability of coumarin to combine with bisulfite to form water soluble solutions. All the impurities are then extracted with a solvent and the coumarin regenerated from the pure bisulfite solution." Ag+ binds alkenes reversibly, and silver nitrate has been used to separate mixtures of alkenes by selective absorption. The resulting adduct can be decomposed with ammonia to release the free alkene. Reference: A. C. Cope and R. D. Bach. "trans-Cyclooctene", Organic Syntheses; Coll. Vol. 5: 315 (1973). "p-Cresol occurring in coal tar can be separated from its isomers by careful fractional distillation which removes o-cresol (BP 191 °C). The mixture of meta (BP 203 °C) and para (BP 202 °C) isomers which cannot be separated by fractional distillation is then sulfonated, and on boiling the sulfonic acids with dilute sulfuric acid at 130 °C, m-cresol sulfonic acid is decomposed and distills off, while p-cresol remains unchanged. The unchanged p-cresol is recovered by hydrolysis." Urea and thiourea are known to selectively co-crystallize with certain hydrocarbons and no others based upon their size and shape. An article published in the Journal of Chemical Education in 1959 describes the phenomenon. The adducts are formed by placing the urea or thiourea into anhydrous methanol. The mixture of compounds to be separated is then added with stirring at room temperature. The adduct crystals are then filtered off and the complex may be disbanded by the addition of water, which gives two phases, the pure organic compound in one phase and the urea/thiourea in the aqueous phase. The crystal structures of these adducts show that the urea or thiourea act as hose molecules by wrapping around the guest molecule in a hexagonal spiral to form a canal. Urea will form an adduct with long straight chain molecules of six or more carbons. Thiourea however will form an adduct with branched hydrocarbons and certain ring compounds. Both urea and thiourea form adducts with straight chain compounds of fourteen and more carbons. Urea seems to prefer carbonyl containing compounds, whereas thiourea seems to have a preference for cyclic hydrocarbons that lack a heteroatom. Mixtures of organic compounds may contain multiple species that are capable of forming urea/thiourea adducts, but it is observed that the urea or thiourea is selective with which compound it adheres to, so that a favoured compound may be complexed and removed from a compound that is capable but less-favoured of forming the adduct. As well as separation, this method can also be exploited to increase the storage life of certain compounds, particularly fats that are easily oxidized in their liquid form. Note that one of the compounds that readily forms and adduct with thiourea is 2,2,4-trimethylpentane--this compound, also known as iso-octane, is the species that the octane rating of petrol is based upon and has by definition an octane rating of 100. It is also possible to separate optical isomers using this technique as described by Swern in Industrial and engineering chemistry. K. A. Kobe and L. R. Reinhart. Separation of organic compounds with urea and thiourea. Journal of Chemical Education, Vol 36, issue 6 (1959), p300. DOI: 10.1021/ed036p300. D. Swern. Urea and thiourea complexes in separating organic compounds. Industrial and engineering chemistry, Vol 47, issue 2 (1955), p216-221. DOI: 10.1021/ie50542a023. 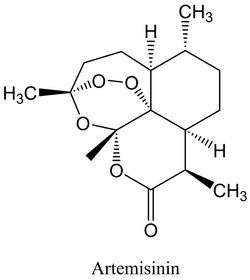 Geraniol was first prepared in comparatively pure state in 1871 by Jacobsen who separated it from Palmarosa oil (Cymbopogon martini S.) by distillation. He also noted the fact that if formed a solid calcium chloride addition product. Since this addition product is insoluble in organic solvents, it can be freed of all adhering impurities and then regenerated by treatment with water. Geraniol is also partially converted to linalool when its sodium phthalate salt is subjected to steam distillation. Primary alcohols form a water soluble addition product with CaCl2. Depending on the mixture in which it occurs, phenyl ethyl alcohol can be isolated by taking advantage of the fact that, in common with many other primary alcohols, it forms a crystalline addition compound with calcium chloride from which the alcohol is regenerated by adding water. n-pentanol and 3-Methylbutan-1-ol are said to also form such a salt. Geraniol forms a crystalline addition product with calcium chloride which is insoluble in ether, ligroin, benzene and chloroform and which is resolved into its components by water. By this extremely simple method, geraniol can also be obtained chemically pure using magnesium chloride, calcium nitrate and magnesium nitrate. Electron withdrawn aryl nitrile compounds have been observed to chelate with titanium tetrachloride. The researcher (Myself), found that a brightly coloured precipitate was formed when placing the compound into DCM and adding a stoichiometric amount of TiCl4. The complex could be broken up with the addition of water, which quenched the TiCl4 to give HCl and TiO2, while the aryl nitrile compound was found completely unaltered and in stoichiometric yield in the organic DCM phase, where, upon evaporation, it had returned to being a perfectly white solid. Photos are shown on my blog post of February 2014. All alcohols including phenols and tertiary alcohols can be treated with boric acid (B(OH)3) to form borate esters, which have very low volatility. The esterification rate is slower with tertiary alcohols than primary or secondary alcohols. Typically, primary/secondary alcohols form a more polymeric borate complex of 2-3 alcohols per mole of boric acid which has a higher BP. Tertiary alcohols tend to require at least a whole mole of boric acid per mole of alcohol, meaning a slightly more volatile complex is formed. Since successful esterification produces water, azeotropic distillation with benzene or toluene is used and removes non-alcoholic organic compounds with it to leave a pasty white solid in the start flask (very hygroscopic and decomposes on attempted isolation). With tertiary alcohols, the distillation must be conducted under vacuum at 110 °C or below as their 1:1 borate complexes are more volatile than the polymeric forms from primary/secondary alcohols. The borate esters are quenched with water to liberate the free alcohol. Alcohols that are insoluble in water are liberated by steam distillation. Enols interfere with this esterification but esters and acids do not. This process is of great use in fractionating essential oils, but can also be used for a reaction work up where alcoholic and non-alcoholic compounds won't separate by other techniques. Reference: J. R. Anderson, K. G. O'Brien and F. H. Reuter. The esterification of tertiary alcohols with boric acid. Journal of Applied Chemistry (London), 2 (1952), p241. An organometallic complexation was observed when a hydroxyl group was protected until the last step of a total synthesis as a 'trifluoroethyl ether' (OCH2CF3). To remove this, lithium diisopropyl amide (LDA) was applied which removed only HF to give 2 fluorines on a C=C double bond. This was then treated with OsO4 (osmium tetroxide) which was expected to cleave back to the hydroxyl. To the surprise of the researcher who thought the precious final compound was 'lost', it was found to live exclusively in the aqueous phase, having formed a very stable and happy ionic complex. 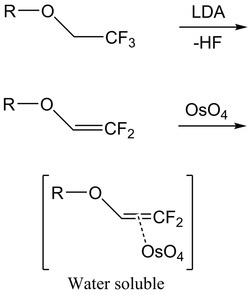 The R-CH=CF2 double bond lends its hapticity to form an adduct with osmium tetroxide. This could be applied to other compounds and is particularly handy coming at the end of a synthesis as a final clean up of the compound. As osmium is expensive, it is worth exposing this 'ligand' to other metals to find a cheaper alternative. Q. Yang and J. T. Njardarson. Base mediated deprotection strategies for trifluoroethyl (TFE) ethers, a new alcohol protecting group. Tetrahedron Letters, Vol 54, Issue 51 (2013), p7080-7082. Q. Yang, J. T. Njardarson, C. Draghici and F. Li. Total Synthesis of Vinigrol. Angewandte Chemie International Edition, 52 (2013), p8648. To protect an NH group you can attach a BH3. The protected >NBH3 group travels well away from the baseline on TLC compared to the original secondary amine. This is due to blocking of the lone pair that would normally cause it to 'stick' and these >NBH3 adducts often travel well in diethyl ether. This may allow it to be collected away from impurities by temporarily increasing the Rf value of the compound. MIDA boronate derivatives remain stuck on the TLC baseline when 1.5% MeOH in Et2O is used as the solvent, but they travel readily (Rf = 0.4-0.6) when THF is instead used as the solvent. The lone pairs on the ether oxygen are less hindered in cyclic ethers and this allows them to form a more covalent-like bond with the boron atom (in a similar manner to the NH group in the example above). This has been exploited as a 'catch and release' mechanism. E. P. Gillis and M. D. Burke. Multistep synthesis of complex boronic acids from simple MIDA boronates. Journal of the American Chemical Society, Vol 130, Issue 43 (2008), p 14084-14085. J. Li, A. S. Grillo and M. D. Burke. From synthesis to function via iterative assembly of N-methyliminodiacetic acid boronate building blocks. Accounts of chemical research, Vol 48 (2015), p2297-2307. A reaction gave two products: a methylcarbamate (69%) and an aniline (27%). As the start materials were plentiful, rather than perform the reaction under altered conditions, the researcher (Matthew Leonard) found that a method for later clean-up was possible which can be described here as 'highly scalable'. This particular aniline refused to take on a proton and enter the aqueous phase even with very strong hydrochloric acid (this aniline had a very electron withdrawn aryl moiety). 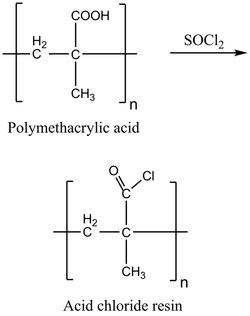 An acid chloride resin was prepared by treating polymethacrylic acid with thionyl chloride. The resin was reacted with the mixture of compounds in chlorinated solvent which removed the aniline compound to an insoluble polymeric form. The tricky part was that the acid chloride resin was hard to prepare as polymethacrylic acid prefers water as its solvent and has limited solubility in the thionyl chloride reagent. A large excess of SOCl2 had to be used and it is preferred to make as small a batch of polymethacrylic acid as possible (dried overnight in a vacuum oven) so that it may be more readily saturated with SOCl2. A noble aim of Advanced Preparative Separation is to better extract artemisinin which is used against malaria and is found in the leaves of Artemisia annua at 0.8-1.2 % dry weight. The strategy as of 2013 is to extract first with hexane or petroleum ether in 10 000 L batches (or sometimes 5% ethyl acetate in 95% hexane) and after removing this solvent, the solids are then extracted into ethanol. This compound is heat sensitive and boiling water is said to decompose it, however I believe at the hexane stage it is gently heated to ~ 50 °C. This process is said to yield 60-70% of the artemisinin present. Charitable institutions such as The Bill and Melinda Gates foundation have funded research which produced a semi-synthesis of artemisinin from artemisinic acid which is useful, but plant derived artemisinin is cheaper and so it is desired to extract more of the compound. A slightly better yield was found with supercritical CO2 extraction but this proves impractical as most producers can't afford the equipment to handle sc-CO2; only cheap solvents and equipment can be considered. My first thought is to try methyl acetate in place of ethyl acetate as it is slightly more polar and does not hold much water at 4 °C. Another idea is to heat gently in aqueous CaO solution to take the compound into the aqueous phase and remove it from other organics (this is shown in the example above to work for coumarin which is surely a function of the cyclic ester which Artemisinin also has). Better yet is to find a metal which can gently complex with the unique peroxide part of the compound and for this I am tempted to try titanium which loves oxygen, or other oxophilic metals in high oxidation state like molybdenum, vanadium, zirconium, tungsten or silver. Success with this strategy would surely increase artemisinin yield to > 90%. A. A. Lapkin, M. Peters, L. Greiner, S. Chemat, K. Leonhard, M. A. Liauwb and W. Leitner. Screening of new solvents for artemisinin extraction process using ab initio methodology. Green Chemistry, 12 (2010), p241-251. J. Xu, J. Luo and L. Kong. Single-step preparative extraction of artemisinin from Artemisia annua by charcoal column chromatography. Chromatographia, 74 (2011), p471-475. I am recently acquainted with the principle that hapticity and conjugation are opposing and in fact competing principles. If one desires to make an organic ligand to bind to a metal, or choose a metal to chelate with a desired organic compound in order to separate, isolate or purify, then one would do well to be acquainted with this principle as it will largely determine the success of the process. Conjugation, which can also be termed as a mesomeric effect or resonance effect, is widely understood to be the delocalization of electrons by alternating single and double bonds. More specifically it is pi bonds every second bond which allow the electrons to move freely. It is well known that a conjugated compound is more likely to be brightly coloured as free moving electrons absorb photons in the visible part of the electromagnetic spectrum. Hapticity, on the other hand, is a concept that is not so widely understood, although a couple of the most prominent examples, namely Ferrocene and Zeise's salt, have been widely circulated and are often taught at undergraduate level. Zeise's salt was first prepared in 1820 but its structure was confirmed by X-ray crystallography in 1970. Note that while cyclopentadiene has two double bonds, it does not meet Hückel's 4n + 2 rule and is not aromatic. These two compounds illustrate the principle that pi electrons will tend to donate themselves to chelation when they aren't able to move freely in a conjugated system. Another compound that contains hapticity is vitamin K2. This fat soluble compound has been observed to facilitate the transfer of calcium from soft tissue to bones and teeth. Many people with osteoporosis have also been seen to have calcified arteries. However, this ailment is lowest in Japan where many people eat Natto, which is high in vitamin K2. Note that as with other fats which have been declared to be 'healthy', vitamin K2 contains C=C double bonds on every third carbon. Each of these double bonds contains a pair of pi electrons that can't participate in conjugation and is forced instead to individually donate itself towards a metal, which in this case is calcium. I have also read that coumarin intake inhibits the activity of vitamin K2, a fact which agrees with the above described behaviour of pure coumarin around calcium ions. Tobacco smoke is high in coumarins and pure coumarin is added to many cigarettes to impart a 'sweet hay' flavour. Perhaps this is why many cigarette smokers are seen to have blocked arteries. Conjugated and aromatic compounds are not seen to chelate to metals. It should therefore be understood that electrons prefer to resonate than to be haptic.